All the flavors of spicy pork tamales are here in this easy skillet recipe! 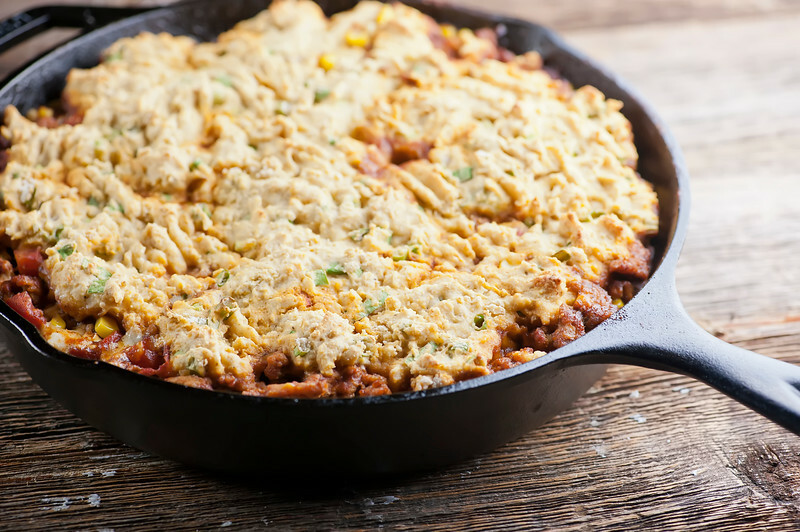 Skillet tamale pie is a quick and hearty one pot version of this favorite supper. This is a recipe for all of you who love tamales (raises hand!) but don’t have the patience to hunt down masa flour and corn husks to make the real deal. 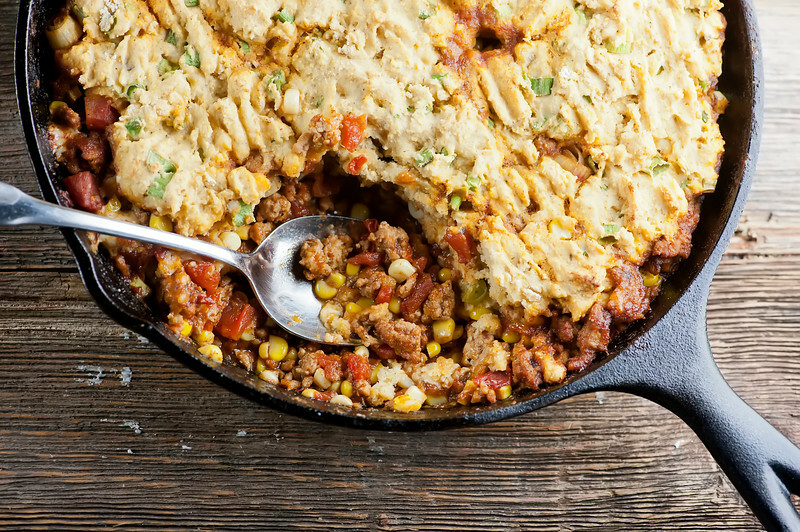 Which by the way you should absolutely do at least once in your life, and this recipe from Bon Appetit will tell you everything you need to know about that, but when you get a tamale craving on a busy Thursday, I highly recommend this recipe for skillet tamale pie. It’s got all the spicy pork and corn flavor, but yep, all in one skillet. And on a busy Thursday night, that is the next best thing for all you tamale-lovers out there…let’s make it!This is yet another recipe that I love to make in my cast iron skillet, and speaking of, have you seen this video from the Buzzfeed Tasty channel on cast iron skillets? Seriously EVERYTHING you need to know. It will make you want to run right out and get a cast iron skillet if you don’t already have one. I have one. Actually I have several, but I have to say that my 12 inch skillet gets the most action, so if you need to pick just one, go for the 12 inch skillet. However, if you don’t yet have a cast iron skillet never fear, any oven-proof skillet will do for this recipe. You are going to start by cooking up the filling, which is a spicy mixture of ground pork, tomatoes, corn, scallions and cheese. Then you are going to mix up the topping, which is a conglomeration of cornmeal and flour and buttermilk and egg and other things, which you are going to pat down onto the filling and pop in the oven until it looks like this. This is one of those recipes where you needed to wait an endless – ENDLESS! – five or ten minutes for it to cool, and then all that’s left to do is to dish it up and let the tamale deliciousness begin. Happy sigh. 1 cup corn (you can use frozen, but if it’s in season, the kernels from two ears of fresh corn are even better! Put three tablespoons of the oil in an ovenproof skillet and heat over medium high heat. Add pork and stir until cooked through, about 5 minutes. Add half of the chopped scallions and the spices and stir. Add tomatoes, corn and chicken broth and stir again, letting the mixture simmer for about 5 minutes. Stir in the cheese and turn off the heat. Mix the cornmeal, flour, remaining scallions, baking powder and baking soda together in a medium bowl. In a separate bowl mix the buttermilk, egg and remaining oil. Pour the egg mixture into the cornmeal mixture and stir until just combined. Pat the cornmeal batter over the pork mixture, spreading it to the edges. Press with a fork to pack it down evenly. Bake the tamale pie in the oven until the topping is just starting to brown, about 20 minutes. I LOVE cast iron!! Love cooking with it and love the rustic look of it. I’ve collected so many pans!! This looks so good – it definitely would be hard to wait for this to cool – I’d want to dig in right away!!! My kinda meal :) Hope you’re having a wonderful weekend! this is one of our supper staples! I went to a small parochial school through seventh grade, and their cafeteria food was divine. One of the special favorites was Tamale Pie. I loved it so much, I told my mother about it. When we had a parent day where the parents met with teachers then ate in the caf with us kiddies, they served Tamale Pie. My mother was a dynamite cook, and she was as blown away as I was. The senior cook wouldn’t give her the recipe. She was so disappointed. Even cute little ruthie couldn’t wheedle it out of her. Many years later when I was lliving and working in the Baltimore area, I decided to try my hand at making it and brought it to a party. It was a hit. It’s just such a great combo of flavors and textures, that who could not love it? Ruthie, I love your comments SO much – you always make me smile with your stories! I too have fond memories of school cafeteria food – I’ve never been able to replicate my high school caf grilled cheese!